Tom and Marcia's Rough and Ready Tours | Tom Blackadar and Marcia Johnson are now living in Shanghai building their business Binocular Vision after taking a break to explore the world. Tom Blackadar and Marcia Johnson are now living in Shanghai building their business Binocular Vision after taking a break to explore the world. 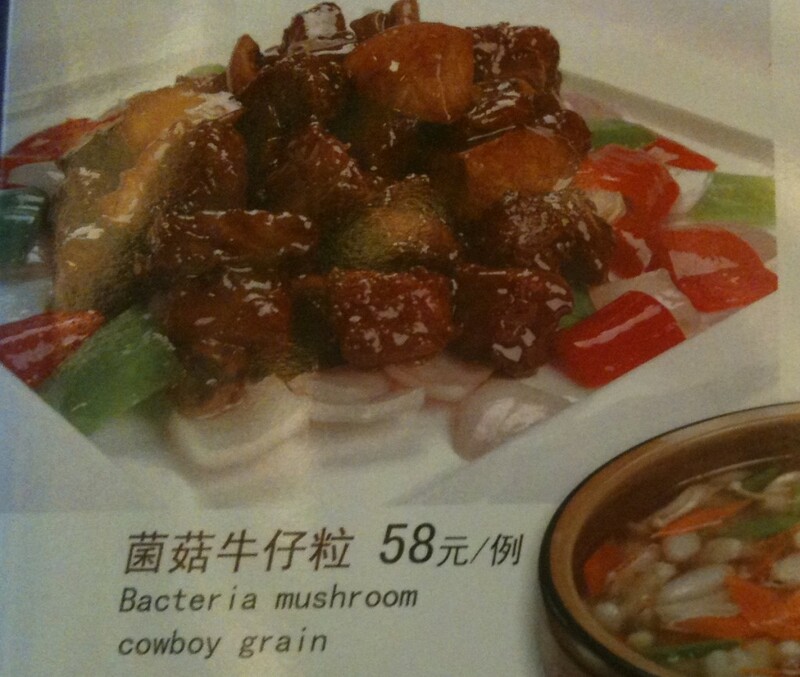 The more I learn about the Chinese language, the more sympathy I gain for the linguistic differences that lead to the often amusing signs that are the subject of many blog posts including our own. Much of the problem comes from the tremendous structural differences between the languages. Chinese is inextricably linked to its thousands of characters. They are not just a representation of meaning and pronunciation, but the language’s fundamental building block. With rare exceptions, each represents a single syllable and a constellation of vague meanings that are often determined by context. Classical Chinese poetry is rich in ambiguity as characters resonate and flow into each other. The concept of a “word” is relatively new to Chinese. In modern Mandarin, words are mostly two syllables, usually composed of two characters that modify each other’s meaning into a specific term similar to those of modern Western languages. But in classical Chinese and some regional dialects, words were the rare exception, and single characters the fundamental unit of meaning. And even now, Chinese words are written without spaces and break arbitrarily across lines, leading to ambiguity that confuses even native speakers. And even two-character words often have alternate meanings, with “snails” translated as “screws”. 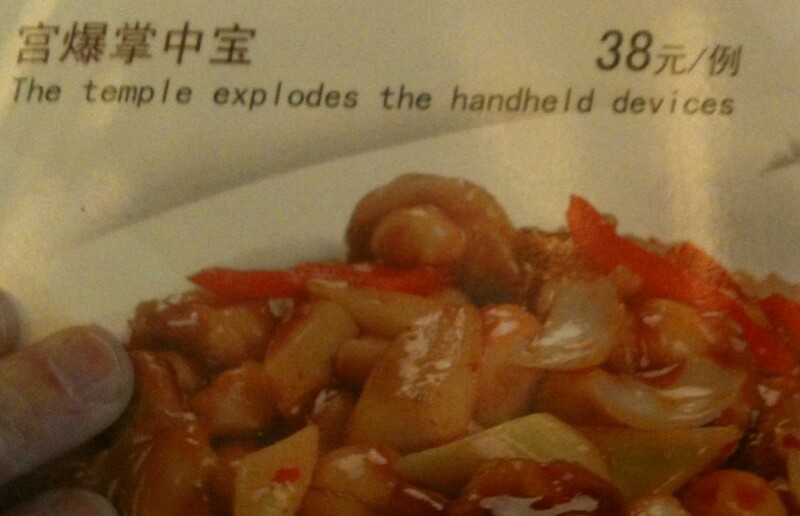 So why don’t Chinese restaurants spend a few dollars and hire a native speaker to check their translations? The answer is simple: English on most restaurant menus is not intended for foreigners, who rarely visit unaccompanied by locals. English is there to make the restaurant look classy and justify higher prices to the local population. Western letters can also be confusing in reverse. 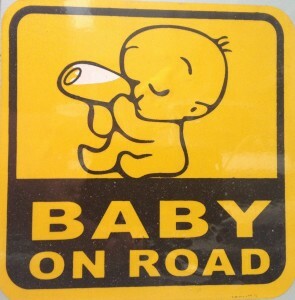 Non-native speakers do not naturally clump letters into words, sometimes substituting another common word with a similar visual shape, as in this “baby on board” sign. None of this explains the signs posted in front of urinals in men’s rooms throughout China. The usual message is the “one small step for a man” already covered in a previous posting. Having made progress with their multi-decade “no spitting” campaign, sanitation officials have apparently decided to try to convince Chinese men to stand closer to the receptacle to reduce the volume of another liquid that often ends up on the floor. 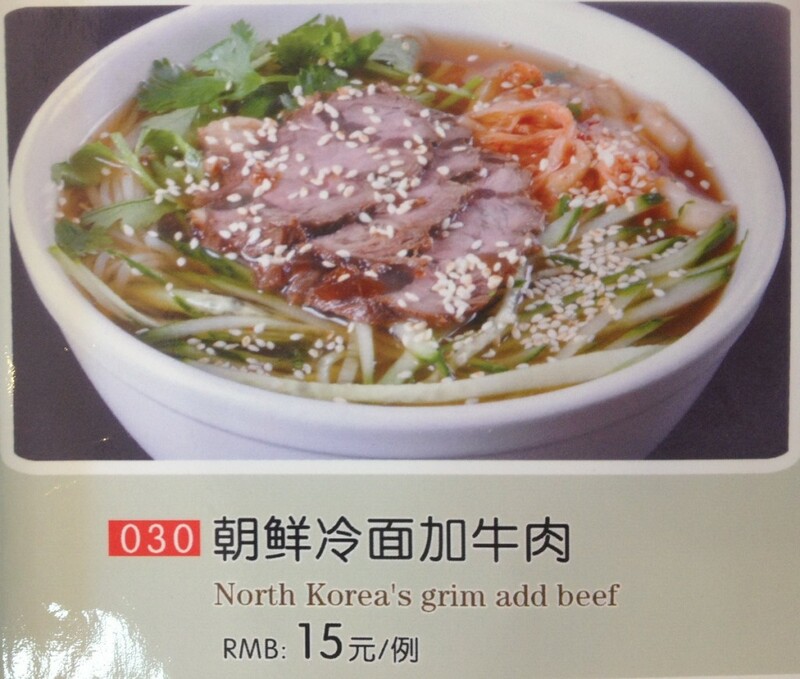 But what should we make of this message in the brand new terminal of Beijing’s Capital Airport? This entry was posted in All, Shanghai on April 21, 2013 by Tom. In October 2012 another business conference gave us the opportunity to visit Qingdao – Tsingtao for beer lovers – in Shandong Province a 1.5-hour plane flight north from Shanghai. Like Xiamen, Qingdao was a treaty port forced open for trade by Western powers. 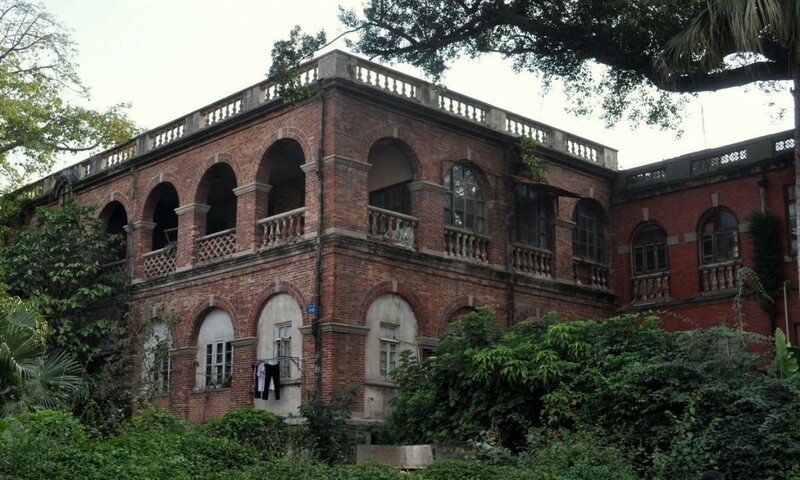 As in Gulangyu, colonial-era buildings are still abundant in the former concession area. 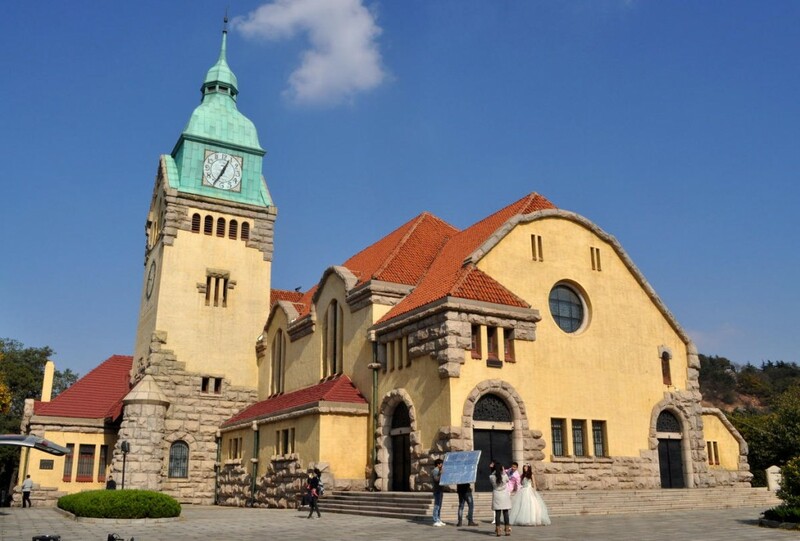 When Germany took possession in 1898, Qingdao was an impoverished fishing village. Local people resettled in villages further to the east, and the Germans set about building wide streets and lining them with solid German-style homes and government buildings. They outfitted the concession with electricity, a sewer system and safe drinking water. 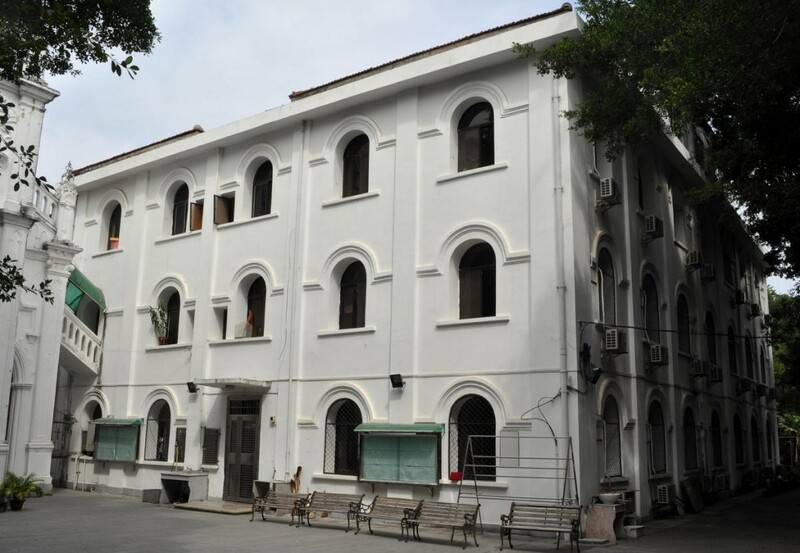 The concession had the highest school density and the highest per capita student enrollment in all of China, with primary, secondary and vocational schools funded by the Imperial German treasury and by Protestant and Roman Catholic missions. In 1903 a joint venture established the now world-famous Tsingtao Brewery. German influence extended to other areas of Shandong Province, including the establishment of diverse commercial enterprises. Germany considered Qingdao a strategically important port. As such the Imperial Department of the Navy, rather than the Imperial Colonial Office, administered Qingdao. From Qingdao the navy’s Far East Squadron conducted operations throughout the Pacific and South Pacific until 1914, when an invasion by an alliance of British and Japanese forces started four decades of political turmoil that continued until the establishment of the PRC in 1949. Fortunately, the Tsingdao brewery kept operating and at one point represented over 90% of China’s exports. Today Qingdao is one of China’s largest ports and a major manufacturing center of both foreign and domestic brands. The city remains Tsingtao Brewery’s international headquarters. Qingdao, along with Xiamen, is arguably one of China’s most livable cities and a favorite summer destination for Chinese tourists. 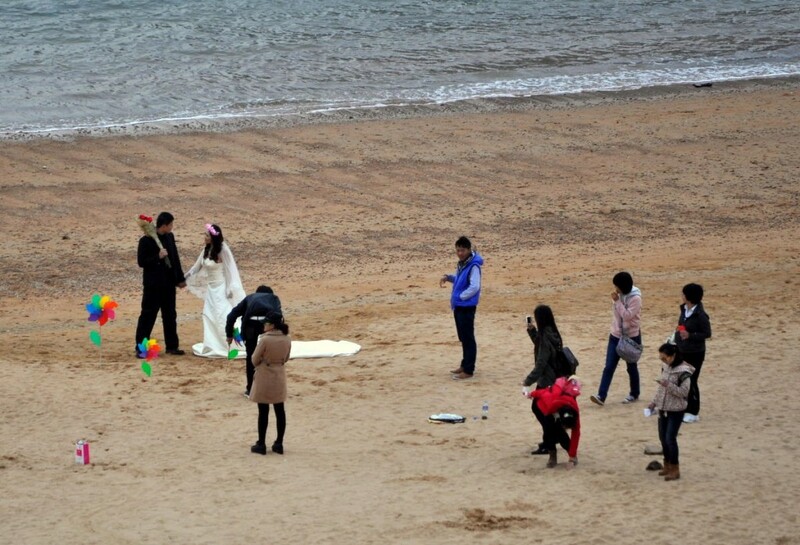 They flock to Qingdao’s beaches to escape the heat, humidity and pollution of China’s interior cities. Qingdao is also popular with foreign tourists, especially Germans. Qingdao became a concession 56 years after Xiamen, so its concession era homes, commercial buildings and government buildings are considerably newer. This fact alone can’t explain the relative condition of colonial era structures in the two cities. When the Meiji-era Japanese displaced the Germans in 1914, they continued to use the German’s homes and buildings and even continued to build structures and improve the city. Historical plaques on many of the post-German occupation, Western-style structures attribute the structures to Chinese architects. 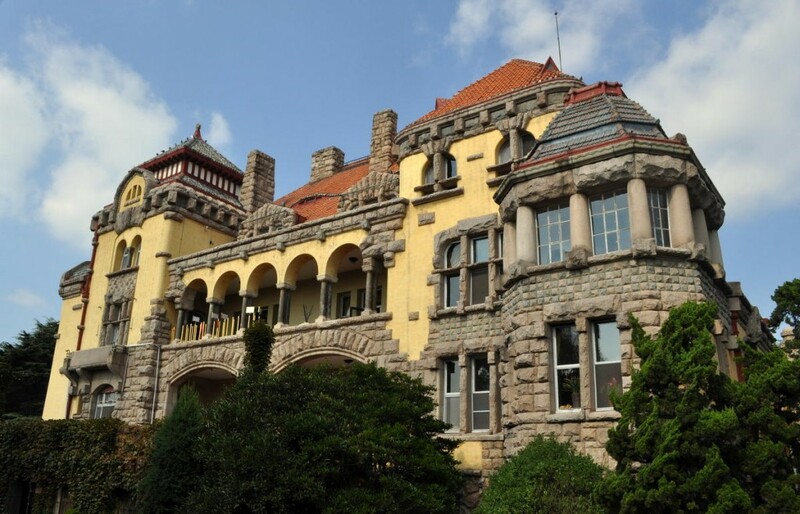 Since Qingdao is relatively close to Beijing, officials could use colonial era mansions as seaside retreats. 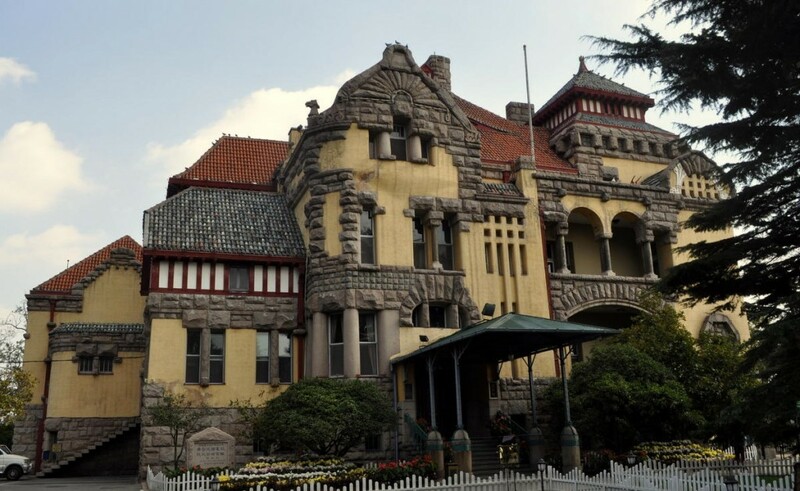 The German Governor’s Mansion, a replica of a German castle, is the jewel of Qingdao’s colonial architecture. Built in 1903 on a hilltop overlooking the city, its construction is said to have been so extravagant that Kaiser Wilhelm II fired the governor as soon as he got the bill. 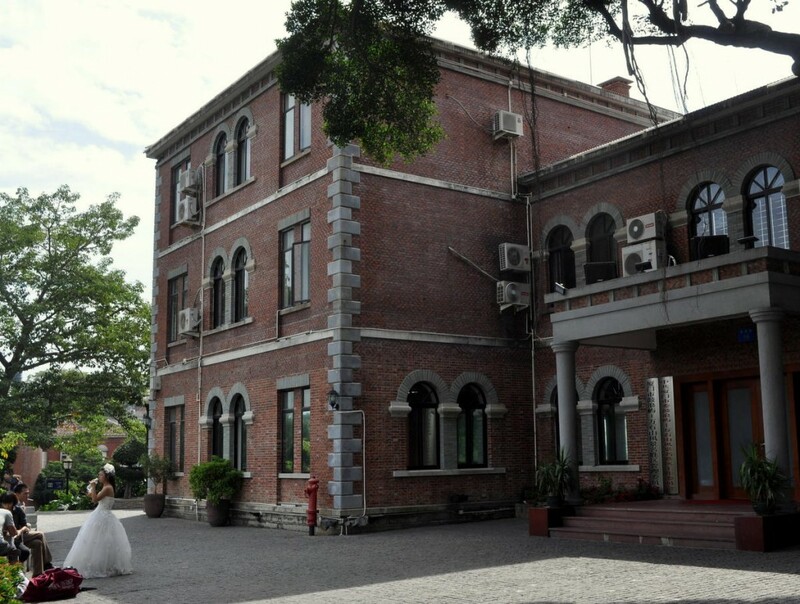 Since founding of the People’s Republic of China, the building has functioned as a guest house for high-level government officials. Qingdao Ying Hotel, as the place is now known, is open to the public as a museum. According to the museum’s interpretive information, Chairman Mao and other top Communist Party officials spent lengthy periods of time with their families as guests. Large half-timbered, stuccoed houses line the narrow tree shaded streets that meander around the hillsides below the Governor’s mansion and give way to German style government and commercial buildings culminating downtown in a monumental Protestant church and a Catholic cathedral. North of the governor’s mansion, the concession area extends onto a peninsula ringed by gently sloping sandy beaches. The upscale residential area is now called Badaguan, Originally eight long parallel streets intersected by cross streets. 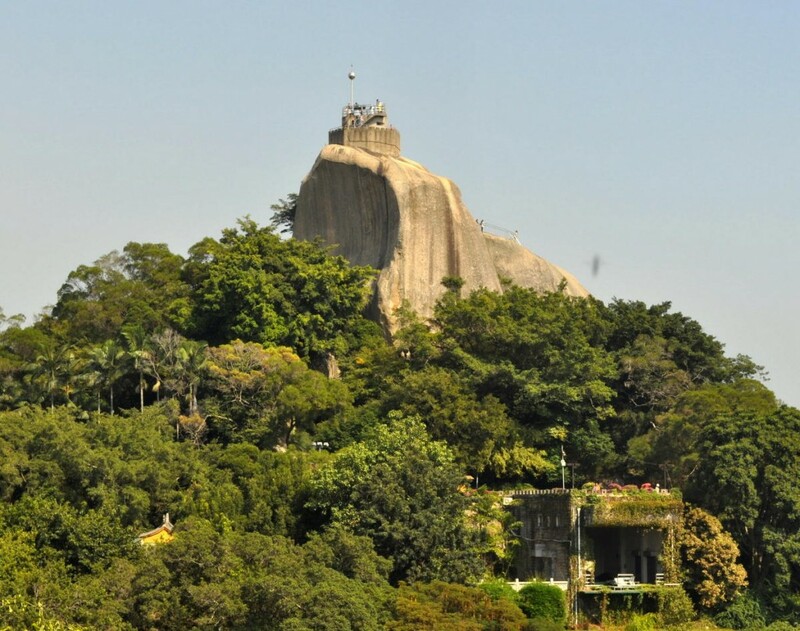 Each of the eight (ba) long streets is named after a famous fortified Chinese mountain pass (daguan). Along each of the eight long streets, the Germans planted a different kind of tree. The now-mature trees shade the quiet streets. Behind gated walls, passersby can glimpse the well-kept mansions and villas along Badaguan’s streets. During our mid-October afternoon visit, the houses appeared to be summer vacation retreats whose owners had mostly returned to duties in the city. But one activity was still in full swing – wedding photos. As in Central Asia, it is popular for Chinese couples to travel around and be photographed in front of famous places. The sessions are organized by agencies who rent the wedding dresses and drive the couple around to the required sites, where they often need to wait in line for their pose in front of an historic building. The whole process can take several days and thousands of dollars, so it is no surprise that the couples’ smiles are sometimes forced. This entry was posted in All, Shanghai on March 14, 2013 by Marcia. Britain and the fading Qing Dynasty held conflicting views on diplomatic relations, trade and administration of justice, and control of the opium trade. When Chinese officials in Guangzhou confiscated and destroyed supplies of opium from British traders, Britain objected to the seizure and used its military might to retaliate. Thus began the First Opium War (1839-42). During the Opium War’s Battle of Amoy in 1841, the British occupied Xiamen. Fighting continued for a year before the Qing government accepted defeat and signed the 1842 Treaty of Nanjing. The treaty forced the Qing Dynasty to accept Britain’s trade-related demands of ceding the island of Hong Kong to the United Kingdom in perpetuity and establishing five “treaty ports”: Guangzhou (Canton), Fuzhou (now capital of Fujian Province), Ningbo (a port city near Shanghai), Shanghai, and Xiamen (Amoy). Soon afterward the Qing also granted similar “concessions” to France and the U.S. Before the 1912 fall of the Qing Dynasty, foreign governments secured more than 80 treaty ports. These treaties placed no reciprocal obligations on foreign governments. To this day Chinese textbooks call these “unequal treaties”. The fact that Western governments forced these treaties on the Qing is still deeply humiliating to the Chinese government and to Chinese people. China is still seeking to recover “face” lost during the period and is struggling to resume its historic role as a powerful nation. In October 2012 a business-related conference gave us the opportunity to visit Xiamen, a 1.5 hour plane flight south from Shanghai. Xiamen is a port city on a large island in Fujian Province. It lies on the eastern side of Taiwan Strait – Taiwan is 180 kilometers across the Strait and actually controls several small islands 6 kilometers off the coast. Xiamen is a pleasant modern city with an active seaport and university, but its greatest historical attraction is a small island called Gulangyu facing the main downtown. Stepping off the ferry after the five-minute crossing, you enter a time warp that is a unique mix of decaying colonial villas and trendy remodeled hotels. Because of its location on the seacoast at the mouth of the Jiulong River, Xiamen has long been a trading center. During the Jin Dynasty (265-420 CE) China first extended control over the area. The city officially opened to foreign trade during the Song Dynasty (960–1279 CE). Trade with the West officially began in 1842 as a result of the Treaty of Nanjing which marked the end of first Opium War. At that time Westerners knew the city as Amoy, its name in the local Hokkien dialect. Xiamen was one of the first “treaty ports” that the Western powers forced China to open to trade in the “unequal treaties” of the 19th century. Foreigners who settled in newly built concession areas on the edge of existing treaty port cities enjoyed “extraterritoriality” – exemption from local law as stipulated in the various treaties. They established clubs, race courses and churches and staffed and operated their own police forces and judicial systems. 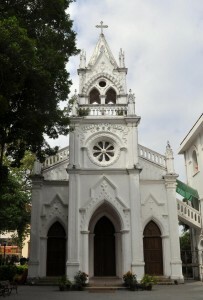 In Xiamen foreigners from many nations built their embassies, churches, clubs and homes on Gulangyu. Wealthy Chinese merchants also enjoyed the concession’s prestige and security, building their own Western-style villas. That security ended in 1912 with the civil upheaval and war following the fall of the Qing Dynasty. 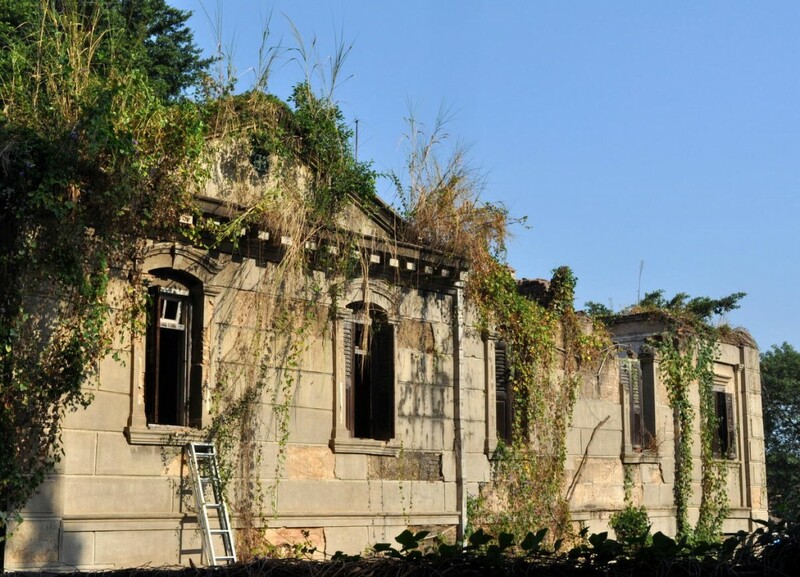 During this time foreigners gradually left Gulangyu, and the island was mostly abandoned after the establishment of the People’s Republic of China in October 1949.Private ownership ended and the abandoned villas became property of the state. 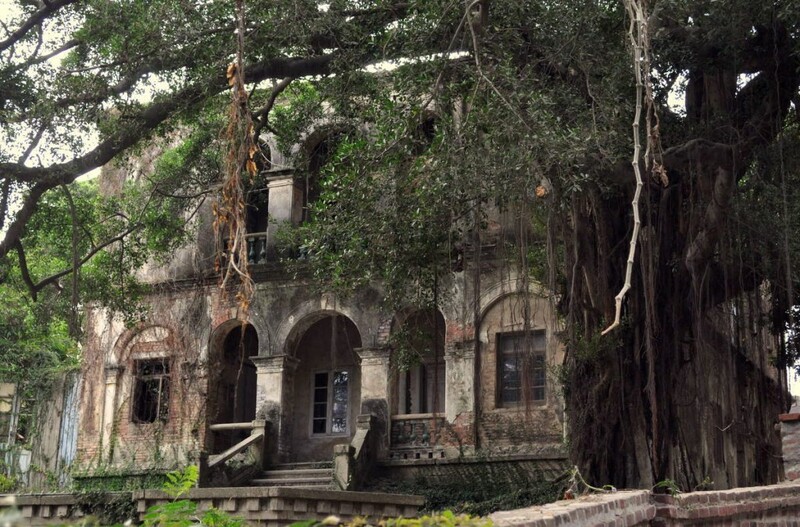 Apart from a few that were continuously maintained, most of the villas and mansions were left to the ravages of time. The former British embassy is now an office building. The adjacent ambassador’s residence is now a small hotel and restaurant. The former Japanese embassy is now a ratty multi-family tenament. Today more than 1,000 colonial era villas and mansions still stand along hilly Gulangyu’s meandering, tree-lined streets. Some have been renovated into boutique hotels and stylish restaurants. Many more have been haphazardly divided into individual living units. Others stand abandoned in various states of collapse. Interestingly, the front entry gate of many – even some dilapidated beyond habitation – bear a plaque designating them as an “Important Cultural Property”. Gulangyu is already a favorite destination for Chinese tourists. 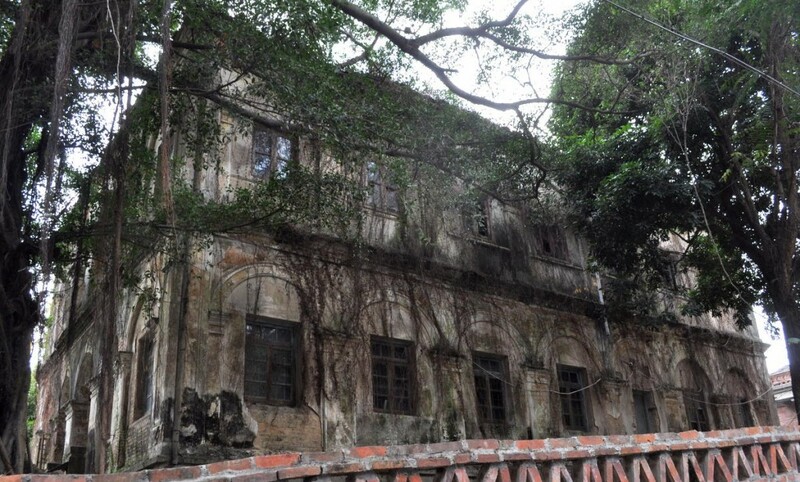 It seems that the Xiamen government, fully aware of this tourist goldmine, has decided to preserve Gulangyu’s heritage architecture in anticipation of privately funded restoration projects. In fact, we observed several restoration projects in progress. 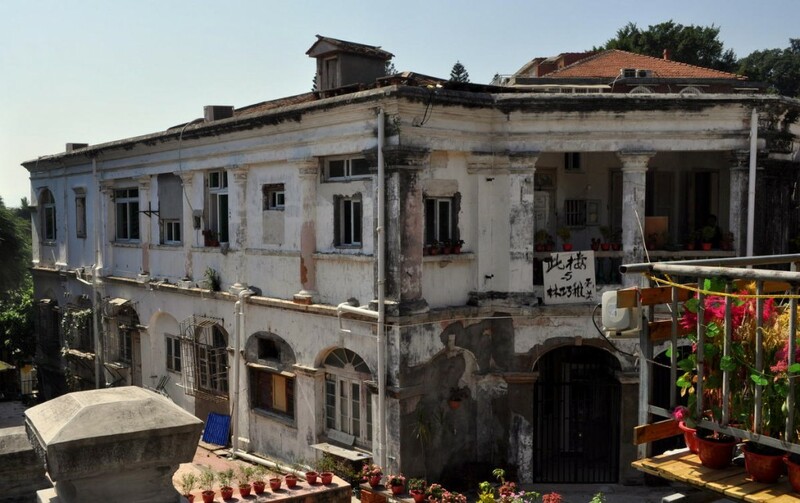 Gulangyu’s historical buildings escaped the wrecking ball that has transformed the rest of China’s coastal cities. Perhaps its island location made shopping malls, high-rise residential complexes and high-rise office buildings impractical. But the island’s strategic importance in the cold-war political standoff kept Gulangyu off-limits to developers. A significant part of the island remains a military reservation to this day. The island has, of course, been discovered by the hordes of Chinese tourists, so the parts near the ferry are packed every day. But it is not hard to turn a corner and find neighborhoods that are still quiet. We particularly liked finding a set of three old tunnels that connect the busy areas to neighborhoods where local people live in decaying mansions with little interaction with the tourists. In the West, central heat generally means a central furnace that produces heat and distributes it throughout one house. In China, central heat means a city-wide centralized system that produces heat and distributes it to homes and offices through a network of dedicated pipes. Since ancient times, Chinese people have divided north and south at the Qingling Mountain Range, stretching east-west south of the city of Xian in southern Shaanxi Province, and the Huaihe River, stretching east-west between the Yellow and Yangtze Rivers. In the 1950s in an effort to best allocate scarce resources, the central government designated this line as the central heat line. Winter in northern China is much colder and longer than in the southern parts. Winter lasts up to six months in northeast China, where temperatures can drop to minus 40 degrees. North of the line in cities like Beijing and Dalian, the government built and continues to maintain community-wide central heating systems that produce indoor temperatures so warm that people sometimes open windows. Compared to the northern parts, winter in South China is warmer and shorter. Temperatures in South China rarely drop below freezing. In some places winter lasts little more than a month. In these areas, central heating was never built, and even basic thermal insulation is generally absent. Exterior and interior walls are constructed of cement that absorbs and stores winter’s cold. Cold air leaks in through window frames and under doors. But in Shanghai and other cities just south of the central heat line, people also feel the harshness of winter just like their neighbors north of the line. With winter 2012-13’s temperatures colder than usual, people in South China are complaining about the cold and asking the central government to provide central heating in colder parts of South China. We spent the winter of 2010-11 studying Mandarin in Kunming, located in far southwest China. Winter is Kunming’s dry season with fine sunny days but nights that cooled to near freezing. Between December and March the air inside our dormitory, dining room and classrooms felt colder than the air outside. We bought a space heater for our dormitory at the nearby Walmart and, during class, tucked hot water bottles under our down jackets. In Shanghai those who can afford the electric bills install a central furnace unit or modern heat-pump air conditioners on the wall in living areas and bedrooms. In winter these heat pumps run in reverse to provide inside heat, but become inefficient once the outside temperature dips below freezing. Even when heated, rooms are often drafty. Floors are especially cold. To keep comfortably warm, most people dress in layers. At school children wear coats all day. Dining out in all but upscale restaurants, people wear coats during the entire meal. Less affluent people simply pile on more layers. This entry was posted in All, Shanghai on January 8, 2013 by Marcia. December 25, 2012 was Tom’s and my third consecutive Christmas in China. Tom is working on a project for the Shanghai branch of a European pharmaceutical company. The company’s Shanghai office, along with the offices of many Western companies, was closed on Christmas Day. But for most people this year’s Christmas Day, falling on a Tuesday, was an ordinary work day. 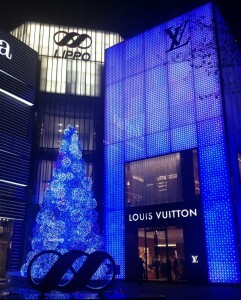 That said, people everywhere love holidays and businesses everywhere love occasions to inspire people to shop. Especially in places like Shanghai where foreigners and their various holidays are quite visible, Chinese have adopted their own version of celebrating foreign holidays – St. Patrick’s Day, Valentine’s Day, Bastille Day, Halloween, Christmas – Cinco de Mayo and June ‘Teenth have yet to catch on. My Mandarin teacher says that any holiday is a good excuse to get together with family or friends to dine around a large round table, play cards or majiang, and sing karaoke. Most often such groups are extended family, classmates from as far back as elementary school, or work colleagues – but rarely casual friends. For or Christmas dinner we dined at Quanjude, not just any old restaurant, but a branch of a famous Beijing restaurant specializing in Peking Duck. Extended families gathered around the adjacent tables probably pitied the two foreigners dining practically alone. From the balcony of our 29th floor apartment, we look down into the courtyard of the historic Pure Heart Church. A few days before Christmas all the courtyard’s trees were festooned with tiny colored lights. I decided to observe Christmas Eve by joining a huge throng of people attending the Monday evening service. The large sanctuary was packed standing-room-only. Two large meeting halls open off the courtyard. Both were packed with people watching the service by video feed. The crowd even overflowed into the courtyard. After the minister finished his sermon, the large choir performed several pieces ending with the Hallelujah Chorus sung in Handel’s English. Everyone stood. The service ended with the congregation singing Joy to the World in Chinese. I sang too – in English. I’ve been surprised that many of the Chinese people I’ve met since living in Shanghai are practicing Christians. Before “liberation,” Christian missionaries, both Western and home-grown Chinese, worked extensively in China since the mid-1800s. Even though the percentage of Christians is low relative to China’s population, the actual number is quite large. Solar New Year is a Chinese national holiday so business, government offices and schools (but not retail stores) were closed January 1-3. (To make up for Wednesday and Thursday, January 2 & 3 off, the central government decreed business as usual for schools, government offices and government-owned companies on Saturday and Sunday, January 5 & 6. So from Friday, January 4, through Friday, January 11, our next door neighbor, who is an engineer and manager with the government-owned electric power company, will work eight days straight. The BIG holiday is Chinese New Year, known here as Spring Festival. Schools will close for a month. Businesses, government offices and many construction sites and manufacturing plants will close for at least a week. All over China, people will jam every form of transportation as they return to their hometowns to spend Spring Festival with their extended families. This lunar New Year’s Day falls on February 10 – the first day of Spring Festival. February 9 is Spring Festival Eve, a festive occasion like Christmas Eve in the West. This year we leave for the USA on February 8 to spend Spring Festival with our own family and old friends at home. If you haven’t already read them and are interested, here are links to previous posts about the Pure Heart Church and Shanghai Christmas 2011. This entry was posted in All, Shanghai on January 6, 2013 by Marcia. Ability to subscribe to receive updates via email and RSS feeds using the tools in the right column. Pages are now categorized by subject as well as date. You can create a login for yourself on the site if you want to participate in discussions. You can now submit comments, which can show up on the site after approval. For now, you are not required to create a login, but I reserve the right to change that if it gets out of control. The site is fast and visible from all parts of the world including China. I can make further improvements in the future. The move should be transparent to you if you have used the old address http://www.roughandreadytours.com. Links from search engines and other sites should also come straight to the right page. People who subscribed earlier to the RSS feed should automatically see to the new one. All of this was far more complicated than it looked, so please forgive me if I missed anything in the transition. Please report any problems to rnrblog@roughandreadytours.net. Although you can continue using the old address, we encourage you to update your bookmarks and links to the new address http://rnrblog.roughandreadytours.net. This will give me the flexibility to make further changes in the future without disrupting you. This entry was posted in All on December 29, 2012 by Tom. Actually not us physically. Our blog has moved. RoughAndReadyTours.com has been hosted on blogger/blogspot since the beginning. Blogger is simple and works well, and I’m grateful that it helped me start the blog at a busy time when my focus was getting into the mountains and not website hosting. But it is blocked in China. Rough and Ready Tours does not get into anything political, but other Blogger users do. And although we have our own name, we share our network address with every blog on the most common Western service. So our blog has been consistently unreachable to our friends in China. It’s not that Chinese people don’t use blogs. Chinese portals like Sina provide hugely popular replicas of blogger and twitter, and since they’re hosted on government-controlled sites, they can operate withouth indiscriminate blocking. But if we moved our blog to one of these sites, our Western readers might have access problems. I have finally done the research and worked out a good solution. I set up a new server in Hong Kong with the address http://rnrblog.roughandreadytours.net (note the .net and the subdomain – www will also work for now, but I won’t promise it will forever). I installed the leading blogging site software (WordPress) and ported all the content with a few fixes along the way. I have added some additional tools such as a button that lets you submit your email address to a service that sends updates by email. Comments from registered users and visitors will also be allowed as long as I am able to moderate it. Feel free to bookmark and begin using the new site as it is now operational. Within a few days, I will redirect www.roughandreadytours.com to point to the new site. This is actually trickier than it sounds, because a surprising number of search engines and sites point links to this blog (we get over 50 page views per day). I think I’ve worked out a way to do it with messages that automatically inform the internet of the change, but I can’t promise there won’t be hiccups. Please send any complaints to rnrblog@roughandreadytours.net. The old site will remain permanently available at http://roughandreadytours.blogspot.com but will not receive any further updates. This entry was posted in All on December 27, 2012 by Tom. How do Chinese people celebrate Mid-Autumn Festival and National Day? There are gatherings with family to exchange small gifts, eat moon cakes, recite poetry and admire the full moon. And of course any festival calls for pyrotechnics. For 1000 years after the Chinese invented gun powder, they used it only for making firecrackers and fireworks. Ever since ancient times, shooting off firecrackers and fireworks has been associated with festive occasions. Traditionally, Chinese people believed that the sound of firecrackers drove away ghosts and evil spirits (bad luck) and invited good luck and material wealth. People still set off firecrackers in front of their homes or places of business. Sophisticated city dwellers do so because it’s a fun and noisy way to celebrate special events: birth of a child, a marriage, an anniversary, being accepted into college, getting a promotion at work or a new job, opening a new business, opening the doors for business for the first time after Spring Festival holiday. People who recently arrived in Shanghai from less developed parts of China may still harbor the ancient superstition. Every day we hear the sound of long string of firecrackers going off in our neighborhood. If there ever were any ghosts or evil spirits lurking here, they’ve long since scattered to quieter parts of Shanghai. The September 30 show was the first of a three-night “Music Fireworks Display” exhibition. A jury selected six fireworks show companies from around the world to compete. This year’s competitors were companies based in Belgium, Canada, China, Italy, Poland and Spain. All six shows were assembled in China using Chinese-made fireworks. The September 30 show featured two 30-minute exhibitions: A Tour of the Aurora Borealis, presented by Apogee Fireworks Company, Montreal, Canada (later announced winner of the competition’s Silver Medal) and a Mid-Autumn Festival-related myth, Chang’e Flies to the Moon, presented by a Chinese company. Huge numbers of pyrotechnic devices comprised each of the two shows. Sophisticated software controlled ignition of the complex array of pyrotechnic devices and synchronized the visual effects with a recorded soundtrack into an awesome barrage of color and sound. Even though the sound system was powerful, explosions often drowned out the music. This entry was posted in All, Shanghai on November 18, 2012 by Marcia. September 30, was Mid-Autumn Festival in China. The festival is harvest-related and reaches back 3,000 years into the mists of Chinese history. Mid-Autumn Festival falls on the 15th day of the Chinese lunar calendar’s eighth month. (The full moon occurs on the 15th day of each lunar month.) On the solar calendar, the festival date varies from year to year and can fall between early September and early October. October 1 was National Day commemorating October 1, 1949, when the Chinese Communist Party established the People’s Republic of China (PRC). With establishment of the PRC, China ended wide-spread civil war which escalated throughout the 1800s before the official fall of the Qing Dynasty in 1911. Chaotic times before establishment of the PRC are still fresh in the country’s collective memory and October 1, 1949, marks the return to a unified country. This year’s Mid-Autumn Festival and National Day combined to create a long holiday. All across China from Sunday, September 30, through Sunday, October 7, schools, businesses and government offices were closed. Since one of the five days would have been a workday, the central government moved the working day to the previous Saturday, when all schools, businesses, and government offices were exceptionally open. (When they don’t have to go to work or school, many people like to shop, so retail shops rarely close.) Chinese people call a nationwide long holiday such as this a “Golden Week”. During Golden Week many people return to their hometowns to reunite with family. Many people also travel to other parts of China or to foreign countries. Shops, restaurants and all forms of tourist facilities remain open. Shanghai Tourism Administration reported that the city handled more than 7.91 million incoming tourists. All forms of transportation were jammed: 1.39 vehicles came into Shanghai through expressway toll stations, 1.63 million vehicles left; 550,000 people passed through immigration at Shanghai’s two international airports. All forms of transportation are packed. Tom and I enjoyed the stretch of fine days during Golden Week to take a break from work and explore Shanghai and the nearby ancient city of Suzhou. Copyright (C) 2009-2013 by Thomas Blackadar and Marcia Johnson.